9. How many people actually work at the station (not scientists, or other visitors)? 8. Where does the poop and pee go? 7. What direction does the toilet water spin when you flush? 6. 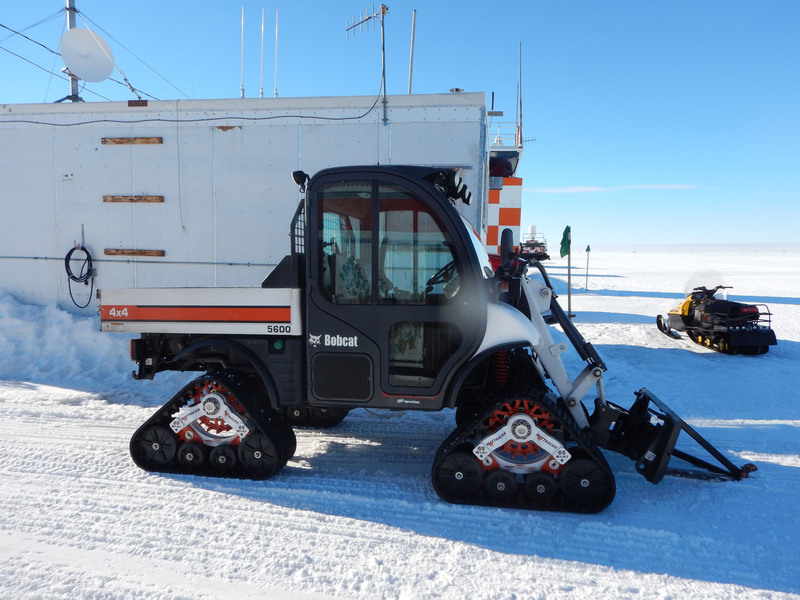 What kinds of vehicles, or other modes of transportation, are used to get around at the South Pole? 5. How much does it cost to support an expedition like yours, or a similar investigation. 4. Why did you want to be a glaciologist. How did you figure out that glaciology was what you wanted to do? 3. What is T.J. testing or looking for in the ice and why? 2. When glaciers move, can it ruin the integrity of your headquarters? 1. Where do you sleep and what are the overall living conditions at the South Pole? 50. What are the requirements to work in Antarctica. Who do you have to talk to? 49. Where do you get your drinking water? Do you melt ice? 48. How does the ocean freezes if it has salt in it? 47. How does the ice core drill work. How do they drill a hole and get the core out? 45. Is Mt. Erebus active. What kind of volcano is it? When will it erupt next? What do you guys have to do if it does erupt? When did it last erupt? 44. Has anyone been born in Antarctica? 43. What is underneath all that ice. Is there water? Land? or maybe even an ancient world full of dinosaurs and palm trees? 42. How much exposed land is available on the continent and how much is covered in ice? 41. What is the population of McMurdo this time of year. What does the population demographic look like? Is it all scientists? 40. How thick is the ice in the summer. 39. How many other bases are on the continent? 38. Are there radio stations, and if so what is the most popular genre of music? 37. Are there are any sports teams at McMurdo (maybe a hockey team)? 36. What has been your most favorite experience thus far? 35. What is the most dangerous thing that has happened to you. When were you most scared? What was your least favorite experience? 34. How long does it take to drill a core to the bottom? 33. Why do you have to work on the ice core in a freezer when it’s already below freezing? 32. What do we know about global climate change? What does the ice tell us? 31. Did you miss being away from Antarctica despite the terms you had to leave. 30. Is there a library at McMurdo? Do you have to bring your own or what do you use for reference? 29. Has there ever been any catastrophes in Antarctica (maybe not while you were there but in the past)? 28. What is the food is like? Is it cafeteria food or do you have an opportunity to make your own food? 27. What kind of currency is used? Is there a bank? How do you pay for stuff? 26. What happens if someone falls through the ice? What happens to trauma patients? 24. What is the most common illness or condition that you see at the clinic? 25. Can you can go fishing? Are there any edible fish available to catch? 23. What kind of seals live around McMurdo? 22. Have they have found fossils in Antarctica? 21. 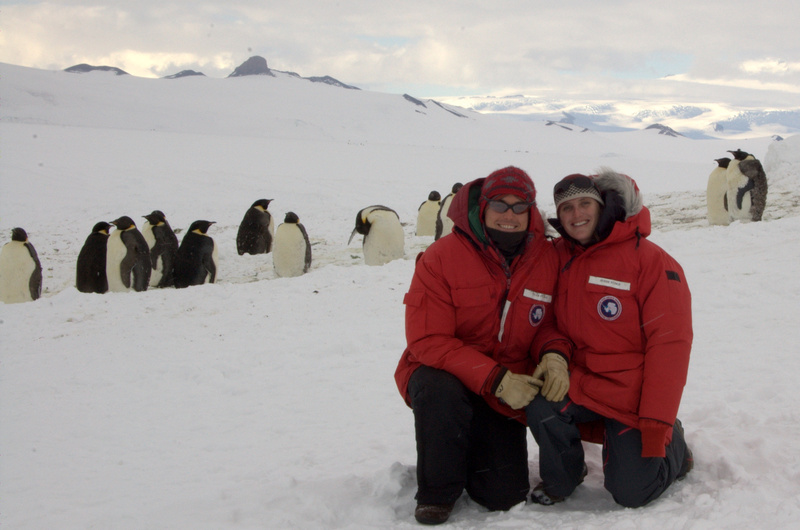 Why did you want to be a doctor in Antarctica, why not just stay in Seattle? 20. Have your sleeping patterns changed since the sun doesn’t set anymore? How does that affect your daily routine? 18. Are there any ‘urban legends’ that are associated with the base? Ghost stories or other legends? 17. Are you going Trick or Treating? 16. What happens if the power goes out? How do you get electricity? 15. 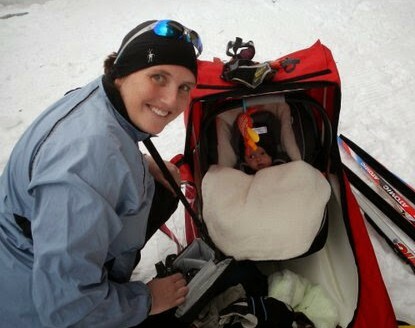 How cumbersome is all that cold weather gear? Do you feel like the kid from the hit movie The Christmas Story? 14. What do you miss most about being away from home? 13. What is your dorm is like? 12. Can you go skiing or snowboarding, or maybe even go kite flying? 11. Who is running the show? Who is in charge? Is there a government? 10. What does the town sounds like? Is it normal or totally weird? 9. What is the food is like? Do you eat astronaut food? 8. Are there ANY animals? 7. What are some medical concerns for extremely cold weather? 6. What is your normal day like? 5. How good is the Extreme Cold Weather Gear? 4. How long does it take to get frostbite? 3. Are there penguins running around like deer do in Minnesota? 2. What kind of TV stations do you get? 1. What is your Antarctic Question? After arriving in McMurdo, I immediately went and checked the flight information for the following day to see if there was a flight to South Pole scheduled. If I didn’t fly, I would have to wait at least an addition 2 days because of the New Year’s holiday. I was excited to see that we were a backup flight, so there was a chance to reach the South Pole on New Year’s Day. 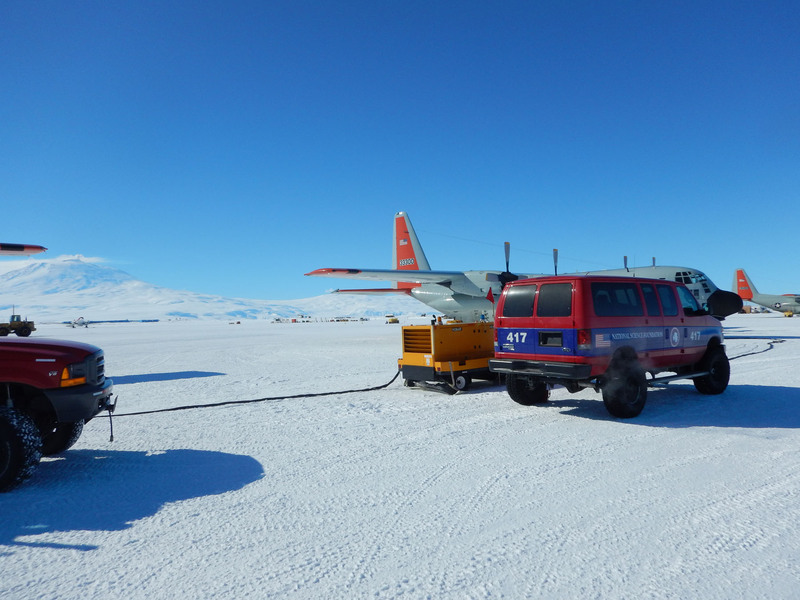 But for us to fly, a flight to WAIS Divide, the ice-core site that I have spent much of the last 5 years working on, had to be canceled. Two friends had been waiting over 2 weeks for a flight to WAIS Divide and the camp could use a resupply. Could I really root for the WAIS Divide flight to get cancelled? I heard that the weather was dicey at WAIS Divide, so it was likely we would fly to Pole. When I woke up in the morning, the WAIS Divide flight had been cancelled due to weather, but the South Pole flight had good weather in both locations. So three of us made our way back to the airfield about 16 hours after we had arrived. Things were looking good, but as with all flights in Antarctica, you keep your fingers crossed until you land at your destination. Landing at South Pole was awesome. Three friends met me at the plane and walked me over to the station. I felt like a pre-teen walking up to Hogwarts Castle for the first time. I had arrived at the geographic South Pole, in many ways, the end of the Earth. 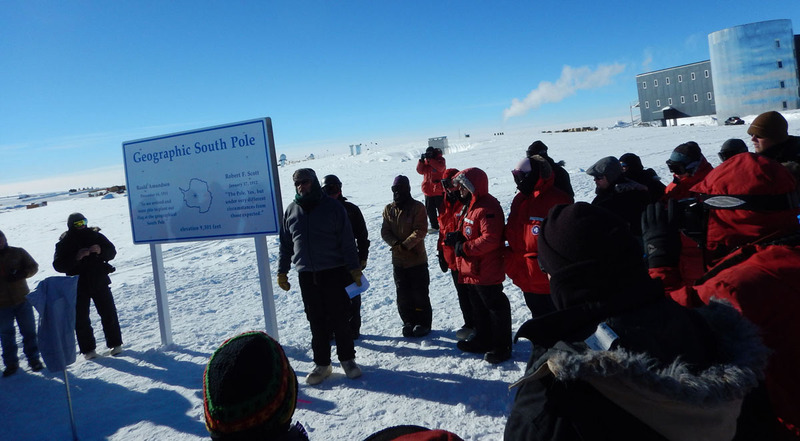 And even better, I had arrived in time for the South Pole Ceremony, by a mere two hours. The South Pole sits on top of 2800 m (9000 ft) of ice which is flowing at 10 m per year (33 feet per year). 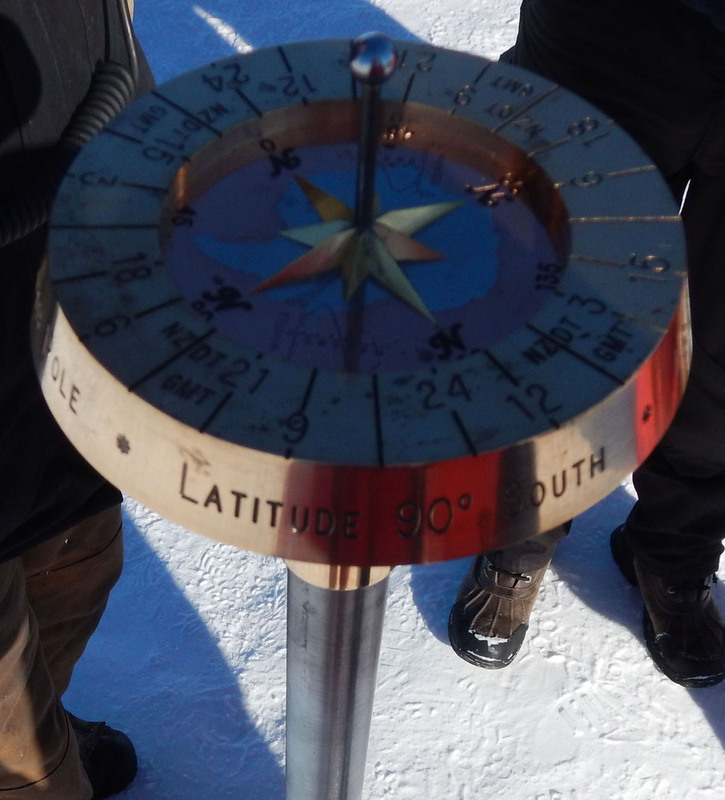 So each year, the marker for the geographic South Pole has to be moved and this is done on New Years Day. The marker is designed and crafted by the winter-over crew each year. Much of the station assembled outside for the ceremony. 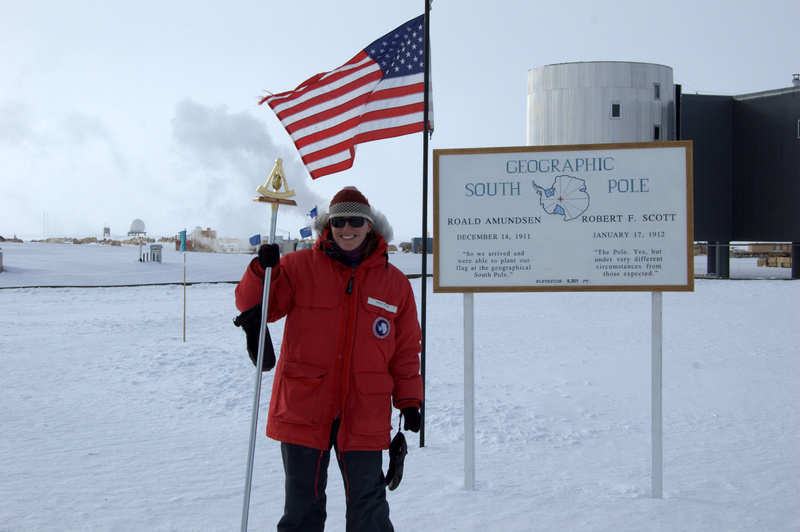 There is a great tradition of markers at South Pole and I was honored to be a part of it. For a glaciologist who measures ice-flow rates, it was particularly fun to be involved. In the station, there is a display case with all of the markers. It looks like the first one was crafted in 1984 and it became an annual tradition in 1987. Arriving in Antarctica is always amazing. This is my third time touching down on the continent, and I gladly take the same photos every time. Just like I never tire of looking out at Mt. Rainier, looking up at Mt. Erebus, the southernmost active volcano in the world, is always a treat. I arrived on New Year’s Eve, making 2014 the first year that I had been both above the arctic circle and below the Antarctic circle in the same year. One more day of a flight delay and I wouldn’t have made it. Landing in Antarctica feels other-worldly as you are dressed in ECW and step off the plane onto snow. But the beautiful weather – just below freezing with little wind – made if feel like an après-ski afternoon on a Spring ski day. Many of the vehicles don’t look that different. But some remind you of the snow-dominated environment you will be working in. 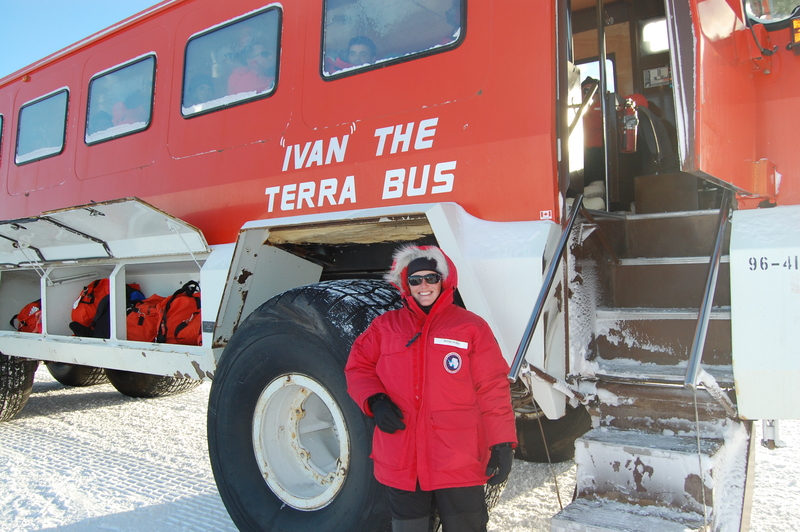 To my surprise, we loaded onto Ivan the Terra Bus, which I thought had been retired. This is Ivan when Jessie was here. And we bounced our way for 45 minutes to McMurdo station on a combination of snow and dirt roads. It was good to be back in McMurdo, but I hoped my stay would be short and I would get to South Pole the next day. 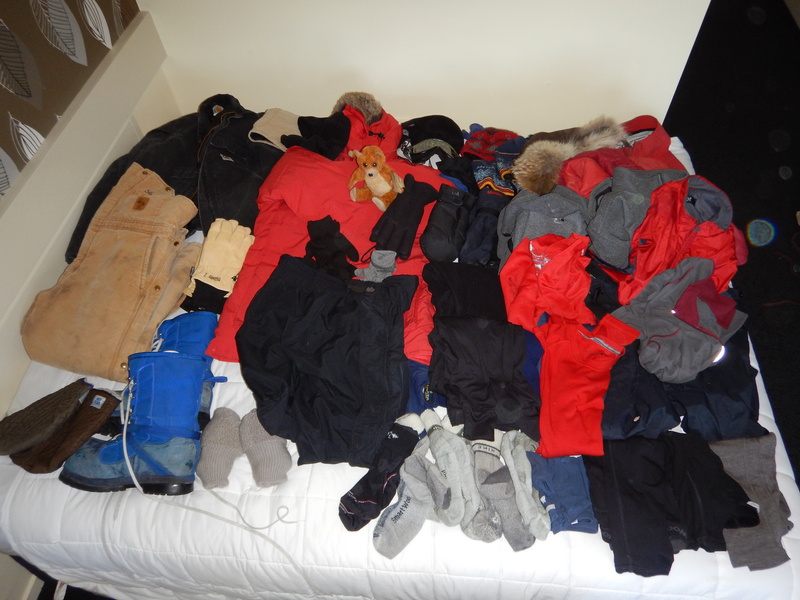 Deciding what clothes to bring with you to Antarctica is the biggest challenge in packing. 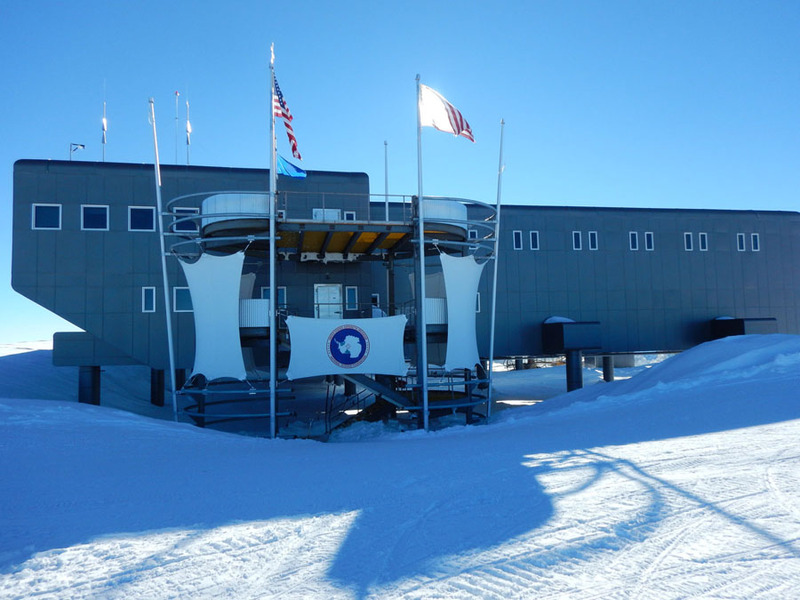 The US Antarctic Program provides all of the essential layers for survival, but not necessarily comfort. So that means bringing down a lot of clothes of your own – but fortunately, the really, really warm gear, called ECW (Extreme Cold Weather) gear is supplied by the USAP. So as you can see in the pile, I have a couple sets of everything. Things are a little more complicated this year as the drilling fluid being used is smellier. So I will be changing my outer layers before heading back to South Pole station. 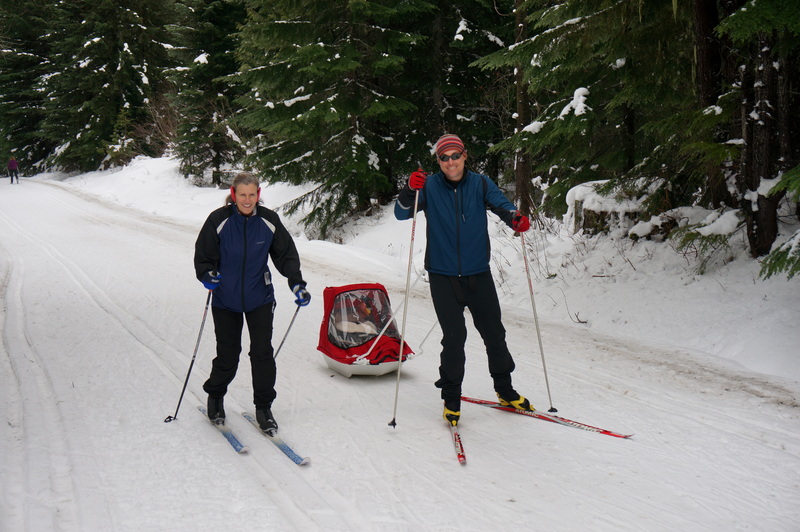 You might notice that I also have what looks like regular ski clothing on the far right. I’m bringing these so I have clothes to exercise in outside. Not sure if I’ll be able to too, but I’d rather have the option than not. 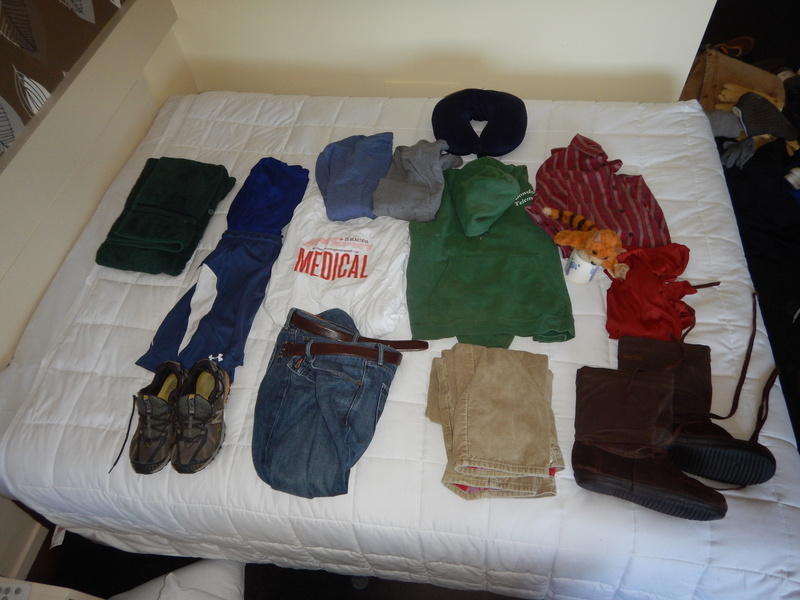 In the last photo, I have my station clothes. Since WAIS Divide wasn’t a full station, I’m not quite sure what I will be wearing inside. But I have some normal clothes as well as a pair of workout clothes – I hear there is a gym at South Pole. In all, it’s about 75 pounds of clothing. I’m sure I’ve brought some clothes that I won’t use, and wish I had brought something I didn’t. But as you can see, I should have enough warm layers not to freeze. You can see current weather and forecasts for South Pole Station here. Get ready for the next Antarctic Adventure! T.J. is heading back to the ice next week and we will be providing regular updates and photos. There have been a lot of changes since we last posted. We are now Dr. and Dr. Fudge. T.J. has completed his PhD and is now a post-doc at the University of Washington. Jessie completed her Sports Medicine Fellowship at the University of Washington and is working in a sports practice in Everett, WA. We have also added a member to the Fudge clan. Adrian was born on October 12, 2013. 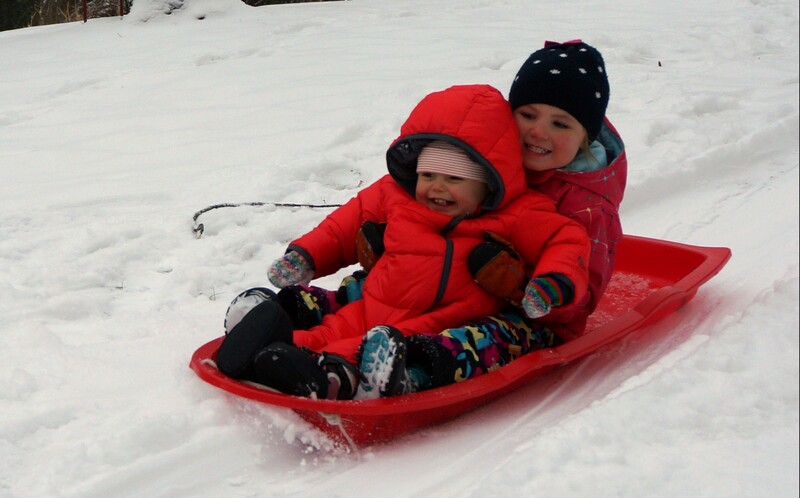 He seems to love snow, and is looking forward to some more “sled skiing” this winter. T.J.’s last project was at the West Antarctic Ice Sheet (WAIS) Divide. He published his findings in Nature. You can link to the article here. His new project will bring him to the South Pole where they are drilling another ice core. Since, I am a bit jealous that he is returning to Antarctica without me, I like to remind him that I was the first Fudge to stand at the South Pole. We look forward to having you follow along on T.J.’s South Pole adventure. Look for new posts starting early January.